In a separate post earlier today, we covered Apple’s updates for iOS at its 2018 Worldwide Developer’s Conference. This was done considering the sheer number of enhancements Apple brought to iOS 12 and the fact that it took up almost half of Apple’s keynote. 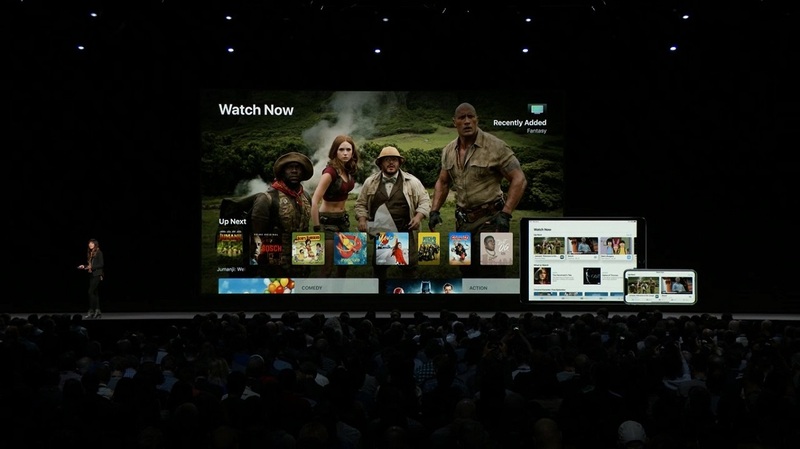 In the second half of our WWDC coverage, we look at the things Apple announced for its other three prominent operating systems – the watchOS, tvOS and macOS for the Apple Watch, Apple TV and Mac respectively. Apple Watch saw a 60% year-over-year growth from 2017, becoming the Number 1 selling smartwatch. That push has largely come due to Apple’s focus on promoting the watch as a fitness tool, and the updates on today’s keynote consequently leaned heavily towards those categories. This isn’t to say they were shy of introducing some new improvements. 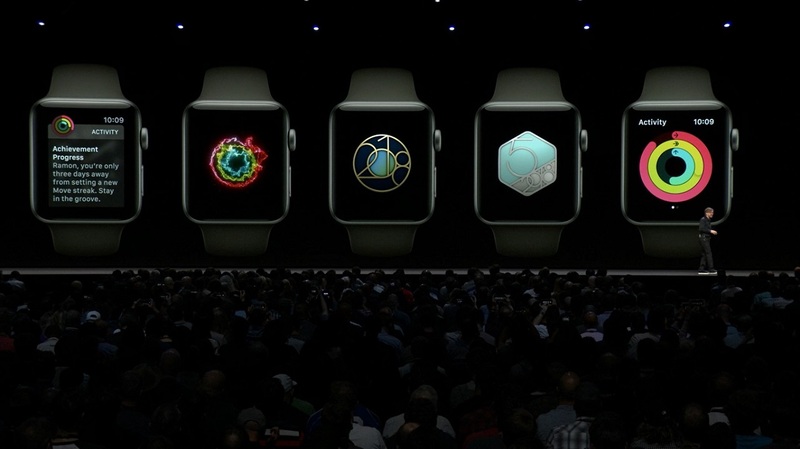 The new watchOS provides a streamlined achievement tracker with a nifty interface that allows you to view your milestones and experience points gained in daily activities. 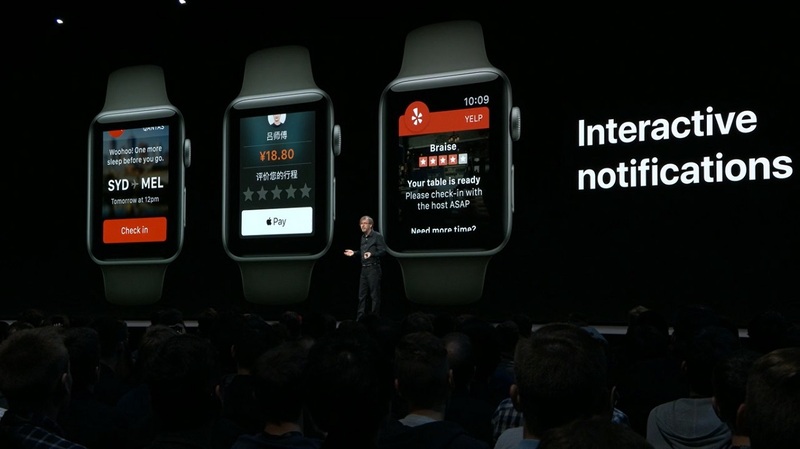 Apple brought some new Apps to the watch, including Podcast (much to the audience’s delight) and Siri Shortcuts that was just announced for the iOS. Moreover, you no longer need to utter Hey Siri to begin your query; merely raising the wrist is enough of an indicator to trigger Siri automatically. Additionally, notifications are now interactive meaning they may include additional options to respond, saving the hassle of switching between the notification and the app. This could save valuable real-estate in a device that already struggles to get some. 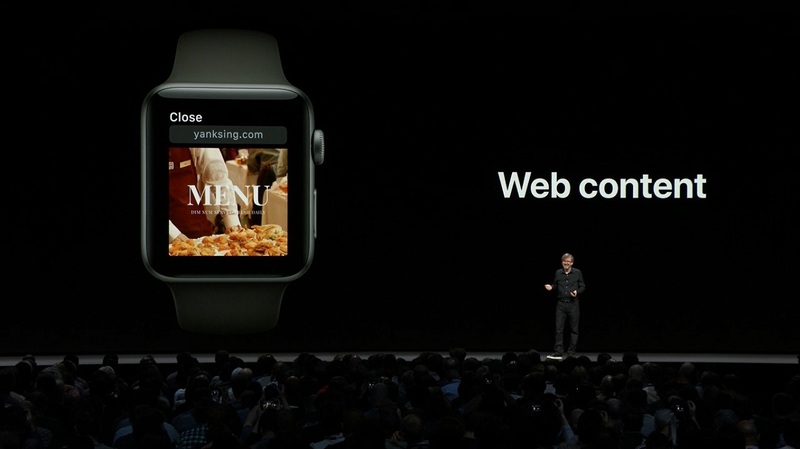 Speaking of which, Apple brought the option to view some web content on the Watch, albeit in a limited fashion. Basic images and text should be visible; just don’t expect web pages to render in their full HTML5 glory. Another new feature introduced through an app was Walkie-Talkie, that allows your watch to relay short messages to another person using WiFi or cellular network. Most of the features were designed around pushing the watch to get as much done as possible with the limited space available, and were demoed through a live workout session. Oh, and there’s new Pride-themed wrist bands to go with the Apple Watch, available starting today. One of the biggest and most sought after upgrades to Apple TV finally arrived in the form of Dolby Atmos support. That makes Apple TV one of the few devices to be Dolby Vision and Atmos certified. As was the case with their 4K ugprade last year, Apple will upgrade any purchases made for movies that support Dolby’s Atmos technology should the movies themselves support it. Apple is also tying up with several local content providers to support localized channels. That includes Canal+ in France, Salt in Switzerland and Charter Spectrum in the United States. Support for third-party remote controls is also incoming, as is an even-improved signing experience called Zero-Sign On, that signs you in to your varying subscriber accounts without the need to enter any credentials. Lastly, to make wallpapers interesting, Apple TV has updated its Aerials feature to show location names corresponding to the wonderful vistas that show up, including several stunning looks at Earth taken from the International Space Station. Moving on from the mountain naming convention, this year’s macOS upgrade is called the Mojave. 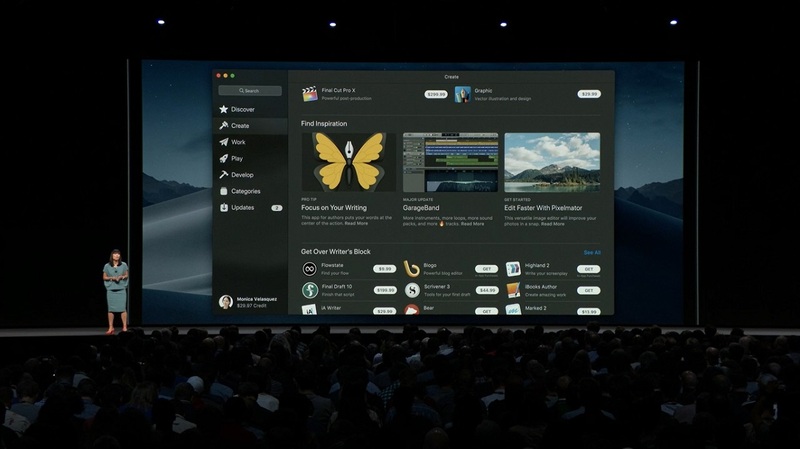 Inspired by the Mojave desert, the OS supports night mode built in, and automatically attunes all apps and content to support this new dark mode. Among the new upgrades introduced was Stacks, which automatically groups your files in a messed up Desktop into folders categorized by type or other criteria. The in-built screenshots utility has been expanded to support screen capture for video as well and Continuity allows you to perform actions in your phone, and send the resultant data back to the macOS app. In a rather strange announcement, Gallery View now supports viewing more detailed image previews including additional details about the image or other documents on a right-hand side pane. This is a feature that’s been existing in Windows for ages and I found it baffling to see it wasn’t present on a Mac until this point. The News, Stocks and Voice Memos apps from the iPhone are coming to the macOS, as part of an experimental project Apple is working on to make porting of apps from iOS to macOS easier. It is expected to open up to developers by 2019. Apple also took several measures towards improving security and privacy, including adding permissions to enable integrated comments and making it difficult for sites to fingerprint your identity and build a profile out of your activities. The Mac App store also got a major redesign, its first since 2011, with a new Discover tab that shows new content on a weekly basis. 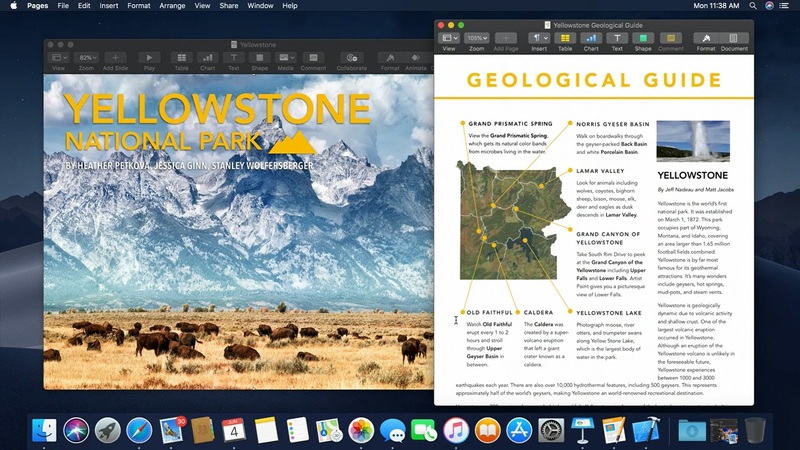 Several apps are also coming to the Mac, including Microsoft’s Office 365, Adobe’s Lightroom CC, Panic’s Transmit and Barebones’ BB Edit. Apple closed off the Mac portion of the conference by highlighting Metal and CreateML, its proprietary technologies for creating graphics and machine learning. Metal in particular scales well with extended GPUs added to the mac, with upto 6.5 times improvement with 3 eGPUs and Create ML allows for Interactive XCode playgrounds and makes it possible to train an elementary machine learning model in 48 minutes, reducing the size by up to 75%. To round off the event, Apple showed off a developer-focused video, highlighting family members of developers and their responses to watch their children do. It was a beautifully made documentary of sorts with the classic Apple touch. Be sure to watch this space as we break down some of these happenings into separate articles for clarity’s sake.